If UML activity diagrams are to succeed as a standard in the area of organisational process modeling, they need to compare well to alternative languages such as those provided by commercial Workflow Management Systems. This paper examines the expressiveness and the adequacy of activity diagrams for workflow specification, by systematically evaluating their ability to capture a collection of workflow patterns. This analysis provides insights into the relative strengths and weaknesses of activity diagrams. In particular, it is shown that, given an appropriate clarification of their semantics, activity diagrams are able to capture situations arising in practice, which cannot be captured by most commercial Workflow Management Systems. On the other hand, the study shows that activity diagrams fail to capture some useful situations, thereby suggesting directions for improvement. W. M. P. van der Aalst, A. H. M ter Hofstede, B. Kiepuszewski, and A. Barros. Workflow patterns. Technical Report WP 47, BETA Research Institute, 2000. Accessed March 2001 from http://tmitwww.tm.tue.nl/research/patterns. 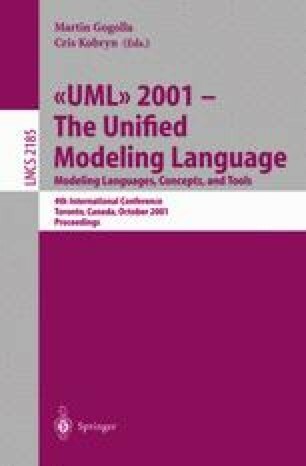 The precise UML group. Home page. http://www.cs.york.ac.uk/puml/. The Object Management Group. UML Extensions for Workflow Process Definition, RFP-bom/2000-12-11. Accessed on June 2001 from ftp://ftp.omg.org/pub/docs/bom/00-12-11.pdf. The Workflow Management Coalition. The Workflow Reference Model. http://www.aiim.org/wfmc/standards/docs/tc003v11.pdf, accessed on January 2001.